ITG Provide confirmation/probate valuations in accordance with HMRC guidelines. Confirmation valuation reports will be prepared within 5 days of our valuer’s visit and will provide a clear indication of the market value of each item within the estate. The valuation report will include images with clear and accurate descriptions enabling quick identification of items of value. The items pictured below are just a small sample of similar items recently valued by ITG Confirmation valuations. 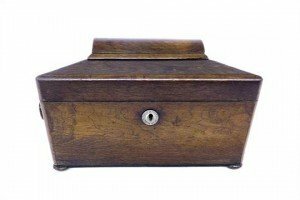 The gallery will hopefully be helpful & educational in demonstrating the wide array of antiques, collectibles & everyday objects we value on a daily basis. 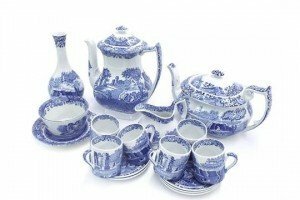 Collection of Spode Italian tea wares to include coffee pot, teapot, six coffee cans, five saucers, saucier and plate, milk jug and further bottle neck vase. 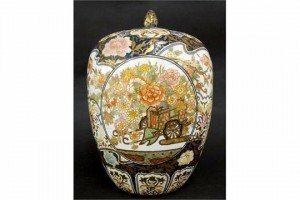 An Imari palette ovoid vase and cover, decorated with floral panels and birds with gilded highlights, calligraphy mark to base. 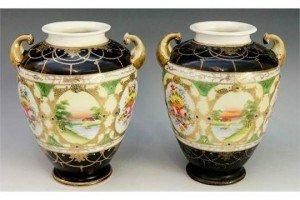 A pair of Nippon two handled vases, the urn bodies painted with a deep band of alternate floral and landscape panels beneath black and gilt pendant borders. 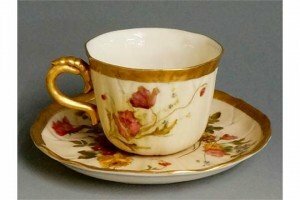 A Royal Worcester cup and saucer with rose and poppy design in yellow and pink, gilded detailing purple Royal Worcester England mark to base of cup. 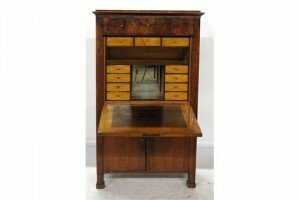 A 19th century mahogany secretaire, having frieze drawer over fall front, revealing maple decorated interior of drawers and mirror, over two cupboard doors. 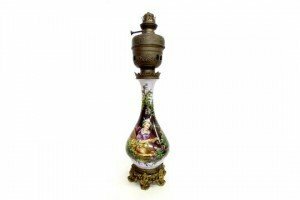 An opaline glass baluster oil lamp, painted with a girl with birds and butterflies in a floral panel, with cast brass and bronze mounts. 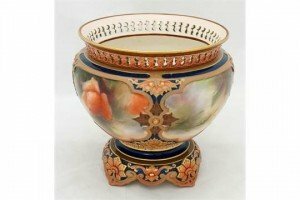 A Hadley’s Worcester pedestal bowl with reticulated pierced neck, the body with four shaped panels painted with apricot coloured roses within lappet and leaf moulded borders in apricot, brown and gilt on a blue ground. 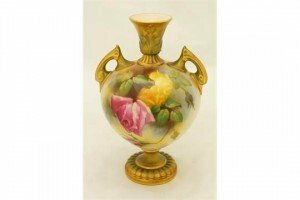 A Royal Worcester two handled vase of compressed urnular shape, the body painted with pink and yellow roses by J Lander, leaf moulded neck and handles, lobed circular gilt base. 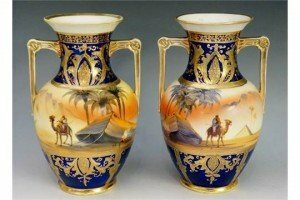 A pair of Noritake two handled vases, the urnular bodies painted with desert scenes beneath blue and gilt formal borders. 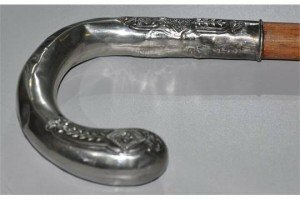 An early 20th Continental white metal handled walking stick with embossed decoration. 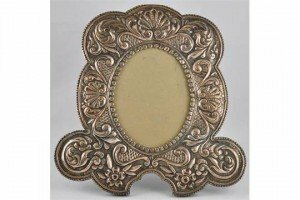 A large late Victorian silver plated easel photograph frame embossed scallop shells and floral scrolls. 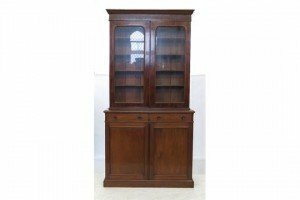 A 19th century mahogany cabinet on cupboard, the glazed upper section having four shelves, the base fitted with two drawers over a pair of fielded panelled doors, raised on a plinth base. 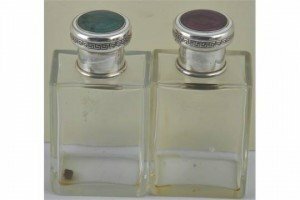 A pair of white metal mounted scent bottles with green and brown enamel decoration. 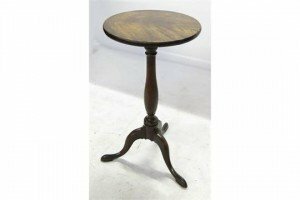 A 19th century mahogany circular occasional table, raised on a turned column terminating in three out splayed feet. 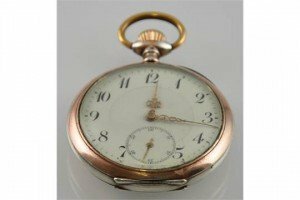 An early 20th Century Continental silver and gold keyless pocket watch, the circular enamel dial with subsidiary seconds. 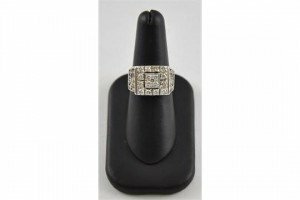 An Art Deco style diamond cluster ring in a white metal band with pierced shoulder, the diamond approx 1ct. 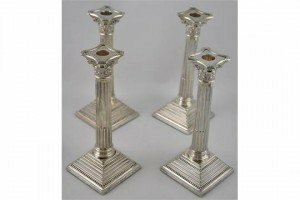 A set of four George V silver corinthian column candlesticks with detachable beaded sconces on stepped square bases, Birmingham, 1935. 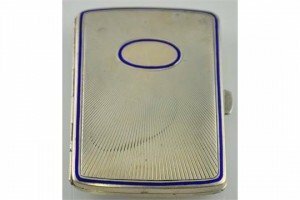 An early 20th century continental 900 standard silver and blue enamel cigarette case. The engine turned body with embossed star motif. 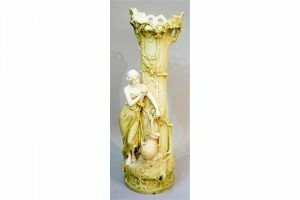 A large Continental porcelain vase modelled as an oak tree, a woman standing before holding a cup, a terracotta jar filling with water, decorated overall in pastel hues.